"Cuddles provided her Mom and Dad with fourteen years of joy. She was an integral part of our vacations, boating activity and daily life. 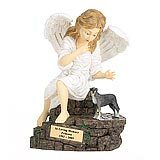 Her prominently-displayed urn and photo help us keep a bit of that companionship intact in a very positive way." 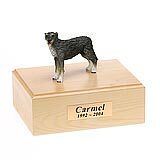 All available Irish Wolfhound dog urns and memorials will be displayed with the figurine on the Irish Wolfhound urn you select and in the appropriate size.